I’ve written before about my love of the Clover bias tape makers for folding bias tape. 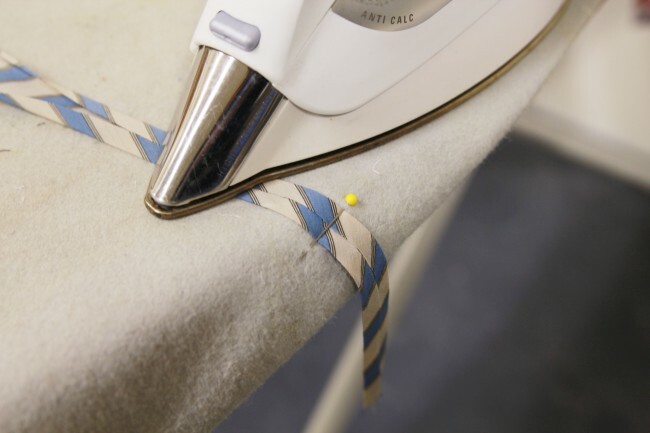 Here’s another quick and easy way to fold bias tape, using just a pin and you’re ironing board. First, fold and press the beginning of the bias tape to get it started. Lay it flat on your ironing board and insert a pin on your ironing board cover, on each side of the folded tape (see the photo). Now simply pull the tape under the pin as you press. The pin will fold the tape for you perfectly, and it’s very easy to see what you’re doing. I love this trick, and it doesn’t require any special tools. Interested in more quick tips like this? You may want to subscribe to Snippets, our weekly email sewing tip. Does it really work as well as the Clover gizmo? If so, I can stop collecting all the different sizes! It might be a little tricky to use this tip for larger sizes, unless you have some pretty long pins! But for this size, I found it worked just as well, actually. Thanks! I’m going to try this! Clever! I’ll be giving this a go. That’s a smart tip, thanks! I have used this technique before it is great. A handy tip to do whilst doing this is to have starching liquid in your iron steamer. I made my own by adding corn starch to water. It makes the bias temporarily ridged, keeping its pressed shape and it’s really easy to work with. Excellent tip, Fiona! I’m going to try this next time. Thanks, you have given me plenty of amazing tips, so I am delighted to be able to give you something back! fantastic idea! thanks so much! Never would’ve thought of that! Great tip. Re earlier questions and different sizes of Clover bias tape makers (I’m a fan of the Clover ones, the rest are junk)….you do want different sizes. For example, the bias tape on a quilt will be different from one used for a garment. I think the pin trick is in addition to to the tape-maker, am I right? Another thought – use the bias glue tape (strips found in a roll usually in notions) to keep the fabric tape from unfolding. Iron to unleash the glue’s goodness onto the fabric tape! Genius! i wish i had thought of that, but i will be trying that from now on! I spent *hours* last night ironing bias tape to make boning channels for a dress I’m making. I wish I’d seen this yesterday! But I will definitely keep it in mind for the future. Thanks for the tip! I’ve seen this before and it’s the only way I do bias tape, as I don’t own a Clover maker. I do frequently feel frustration with this method, though, particularly for larger sizes, as I feel it’s hard to keep the tape even. I haven’t tried a Clover, so I can’t compare, but I did ask for one for Christmas, because I don’t feel this method to be good enough. Yes, I had a recent trial with sheer silk as even with feeding it through the bias tape maker it was very fiddly. I think this would have been a better approach. Thanks for the tip. i’ll have to try this since i don’t have a bias tape maker. genius! No really? I have this T-Shirt waiting for me. Does this really really work? Adding this to the must-try pile! Wow that is a great tip, I can’t wait to try it! I used this last night when or king on the binding for a quilt for my grandson. It took a little time setting it up but was so worth it! I will use this often. Thank you for your wonderful tips!